Very simple, very quick and very delicious, these are the ultimate last-minute drinks. Cranberry Kir Royale: For a wintery take on this classic cocktail, put 15ml cranberry pressé into a Champagne glass and top up with fizz. Garnish with a whole cranberry or a twist of lemon zest. Ginger Champagne: Simply drop a slice of stem ginger (the type that comes preserved in syrup) into the base of each Champagne flute. Add 2 tsp of the ginger syrup too for a sweeter, spicier drink. Fill with Champagne and serve. 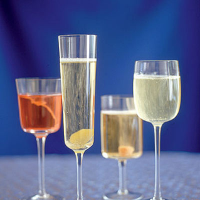 Classic Champagne Cocktail: Put a sugar cube in the bottom of a Champagne flute. Add 4 drops Angostura bitters, then 20ml Cognac. Top up with Champagne and serve. Champagne Cobbler: Try this citrus-scented bubbly idea, taken from the fabulously useful Sauce Guide to Cocktails (which you can order from sauceguides.com). Pour 20ml Cointreau, plus freshly squeezed lemon juice to taste, into a glass and top up with Champagne.